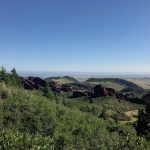 Colorado’s plethora of hikes ranging across all difficulty classifications can often seem daunting and downright intimidating. So, in an effort to facilitate member ambition and encourage thirst for adventure, the CMC organized the Ascending Hike Series. Throughout the summer of 2018, members will enjoy hikes of increasing difficulty ratings—starting with the basics before bagging a Fourteener in September. 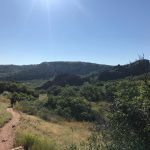 The series is specifically designed for individuals who are looking to tackle these hikes and challenge themselves in the process. The CMC’s inaugural Ascending Hike Series is now heading into its third month. 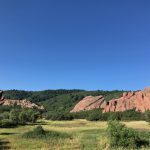 On July 24, several members gathered to conquer Roxborough State Park’s Carpenter Peak Loop – an eight-mile hike classified as Easy B. We checked in with a few of these members to understand their goals, and to find out how the series has helped them move closer to the realization of those goals so far. 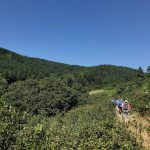 In addition to the promise and challenge of increasingly difficult undertakings, these members were also drawn by the possibility of becoming more knowledgeable hikers. When asked about other motivations for joining the series, Davis acknowledged the importance of education on the trails. “Learning from the leaders about the hikes and general hiking tips is always helpful.” The expertise of the leader of the Carpenter Peak hike was especially relevant, as the outing was led by Dave Thomas, a tenured volunteer naturalist at Roxborough State Park who is full of useful information. Davis was not alone in her motivation to learn. “I learn a lot by talking to other members and the leaders about what hikes to do and what classes to take – that’s the kind of advice I’m looking for,” said Printz. 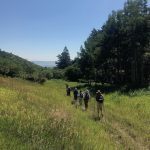 These beginner hikers enjoy the ongoing benefits of improved fitness and hiking knowledge as the series continues, but there is one other benefit that’s often overlooked: CMC members are becoming familiar with others who share their ambitions and are bonding over the tribulations that come with them. This is exactly what Thomas, the trip leader, had in mind. “I want the people on the trips, most of all, to enjoy themselves by chatting and carrying on,” he said. This hope was confirmed by the participants. “I get to see the same people every week and getting to know people and seeing them again, that’s really nice,” Gross said of the fellowship being formed thanks to the series. Davis highlighted how the camaraderie aspect of the series has helped with holding herself accountable. “I’ve always been rather hesitant to get out on my own, and this gave me an organized opportunity to go out with a group,” she stated. “Most of these ladies have been hiking the entire series together, so it’s been nice to see familiar faces,” she continued. The companionship the series has allowed its participants to develop was obvious. Continued banter and laughter reverberated through Elk Valley—despite the fact that the steepest portion of the ascent was upcoming. The mind is easily distracted from the difficult tasks that lie ahead when the comfort of friendship is present. So, undoubtedly, whatever their aspirations may be, CMC members will be accompanied by friends and shared challenges, making the trail to success a bit easier. If the Ascending Hike Series sounds like something you might be interested in, it’s not too late to check out the remainder of the scheduled trips at www.cmc.org/calendar.